Did you ever have a big piece of furniture that you just wish would go away? After years of decorating homes, I think I’m fairly good at ordering pieces that look exactly like what I wanted when they’re delivered and placed in my home. Several years ago, when we first switched to a king sized bed, I decided to buy a sleigh bed because my son had one that was incredibly comfortable. I loved the way the sloped back made it so easy to sit in bed and read or watch TV. And it WAS comfortable when we got it. But it was so big and bulky in the room. I knew it from the day it was delivered. But I kept it anyway. And I hated the way it looked every time I walked in the room. Hated the way it pushed the bed out from the wall, hated the big expanse of dark wood, hated the lack of pretty detailing. I knew it was a mistake and once I kept it, I knew I had to live with it for a reasonable length of time. Well, I finally decided enough time had passed. I have two adult children. Surely someone will want a king size bed at some point in the future. I have room to store it. So I started to think about what kind of headboard I really wanted. For certain it had to be light colored, and I liked the idea of a padded headboard for comfort. I decided to go with a white tufted headboard with nailhead trim and wingback sides. (See resource list below.) 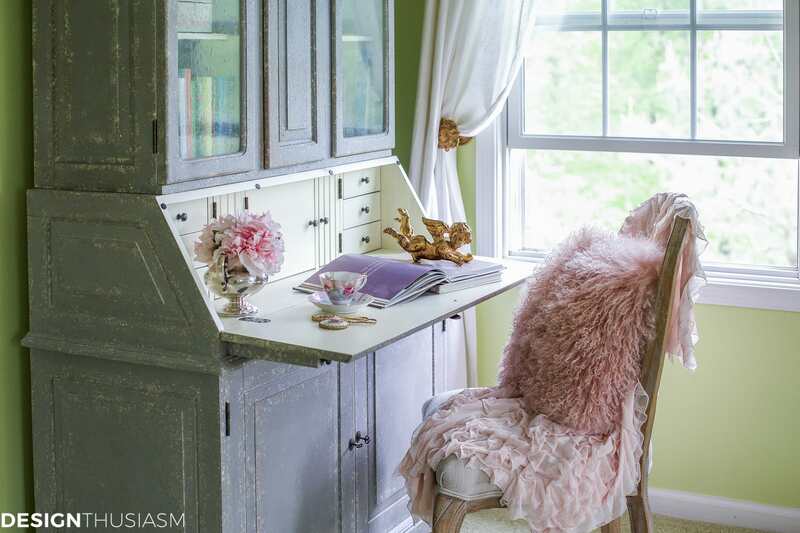 The tufting adds a touch a feminine detail that I find so pretty and the nailheads lend a bit of edgy fun. My master bedroom is a work in progress that I don’t think has completely found its identity yet, but the bed has brought us significantly closer. I think the disconnect is largely because I have dark wood furniture, but the painted secretary and hutch in the corner is spot on. 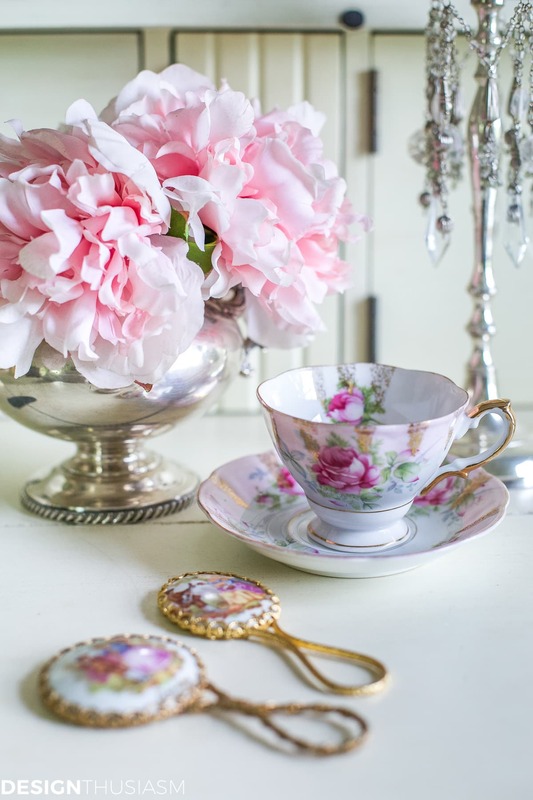 Faux peonies in a vintage silver urn, floral china teacups and enamel dressing table items help communicate the modern French Country look that I crave. 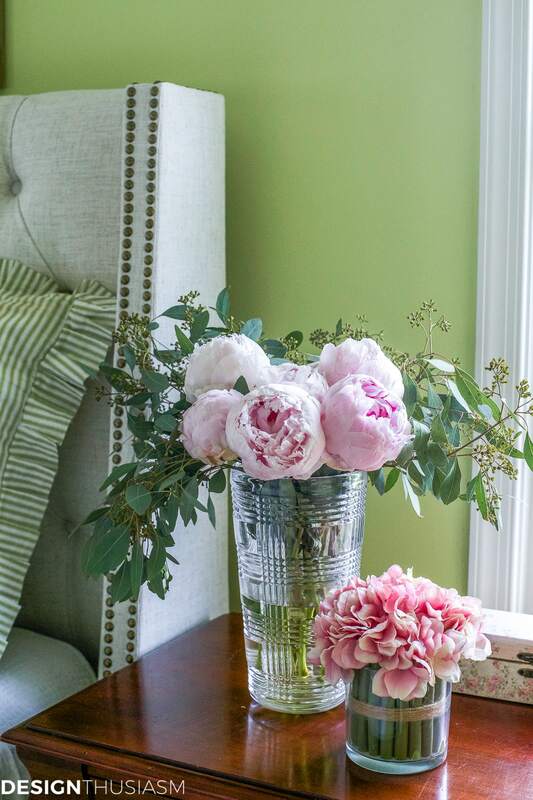 And if there’s one thing better than faux peonies its fresh peonies. I have no qualms about mixing them in the same room. 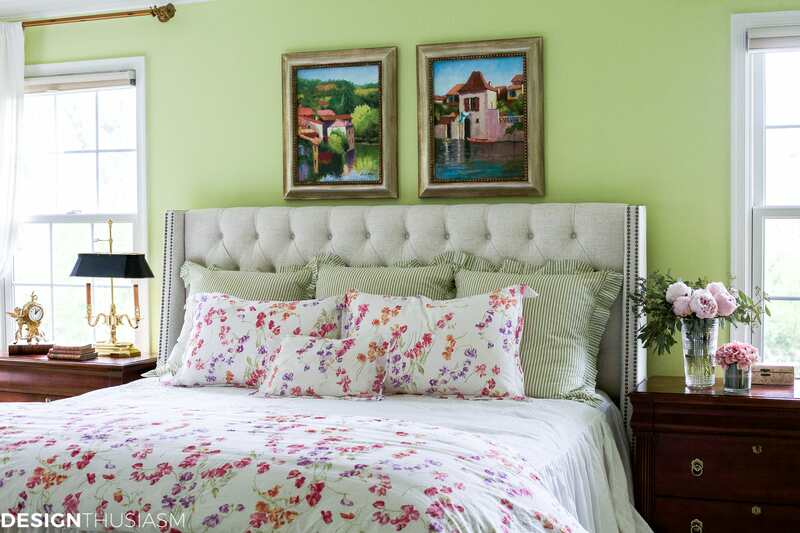 I love waking up in this cheery room with spring green walls. I don’t know that I want to change that, even as I begin to go lighter and whiter in many of my rooms. 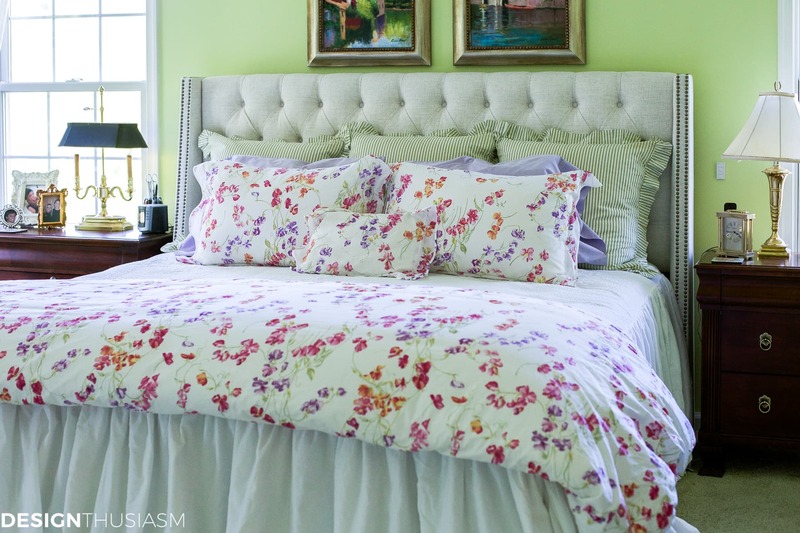 I may switch the euro shams out to a crisp white, but my lovely French linens in a Pois de Senteur (Sweet Pea) pattern are something I’m still madly in love with. 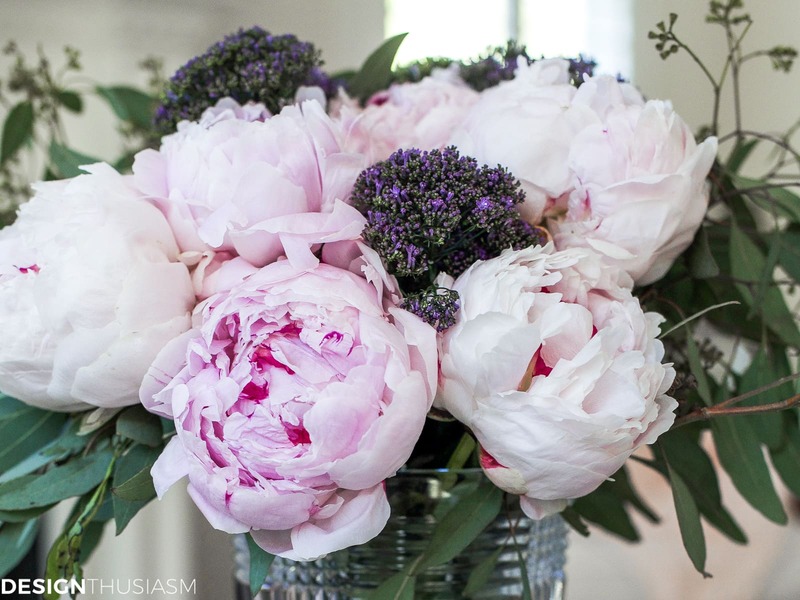 How pretty they look against my white tufted headboard! As I keep returning to this corner I realize, the rest of the room could still benefit from a bit more gilding and, no doubt, some crystal drop lighting. There’s also plenty of room for a bench at the foot of the bed, but hubby thinks he’ll trip over it. We’re currently in negotiations over that one! The new bed is not just a headboard, and includes fabric side panels. I love the full white coverlet on the bed, but I also have the option of using it without the coverlet and exposing the panels. It’s such a pleasure to have this one new piece in the room to really help define the direction of the space. It’s an enormous change from what it looked like before and I’m excited to move forward as the room takes shape! Very pretty and light. 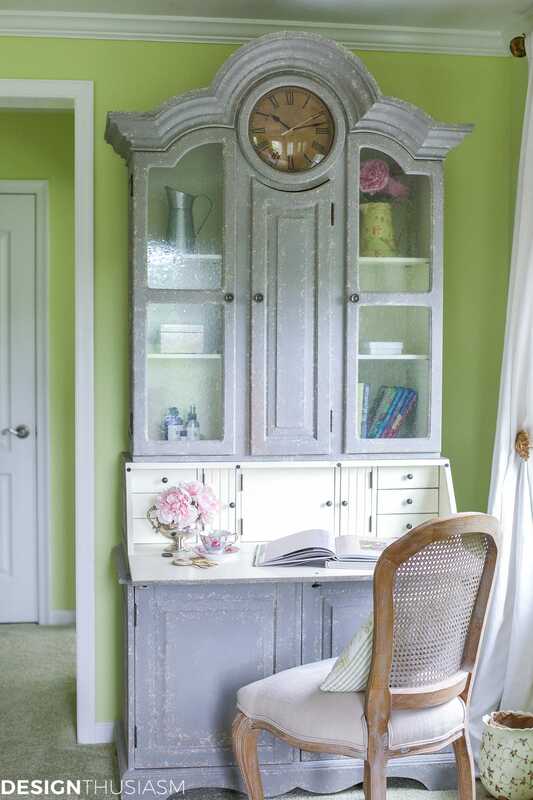 I especially love the painted secretary. We just took the twin pine sleigh beds out of one of the guest rooms this weekend! 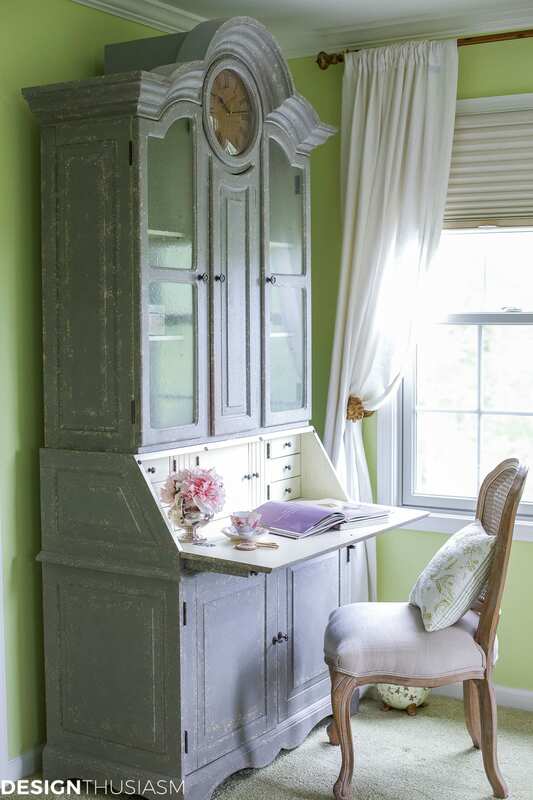 I am turning it into a beautiful closet (chandelier,chaise, and all ) very happy to do this, although feeling a little guilty getting rid of the beds, always liked them a lot. Not being used though. 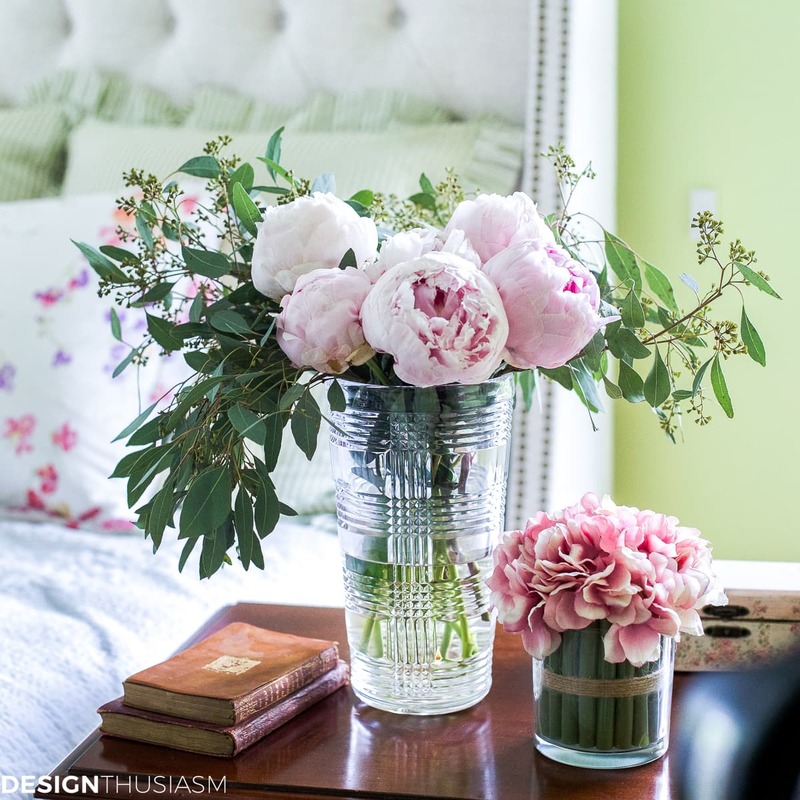 The colors in your bedroom are lovely and cheerful. Looking forward to your next ideas. I like the dark side chests, but can see your next ones will be nice too. Great room! I want to thank you for having decent and real artwork in your bedroom…oftentimes people have great taste in furnishings but then it just falls apart at the end W their choice of artwork..again thx!!! I had the same problem when I changed my bedroom furniture. 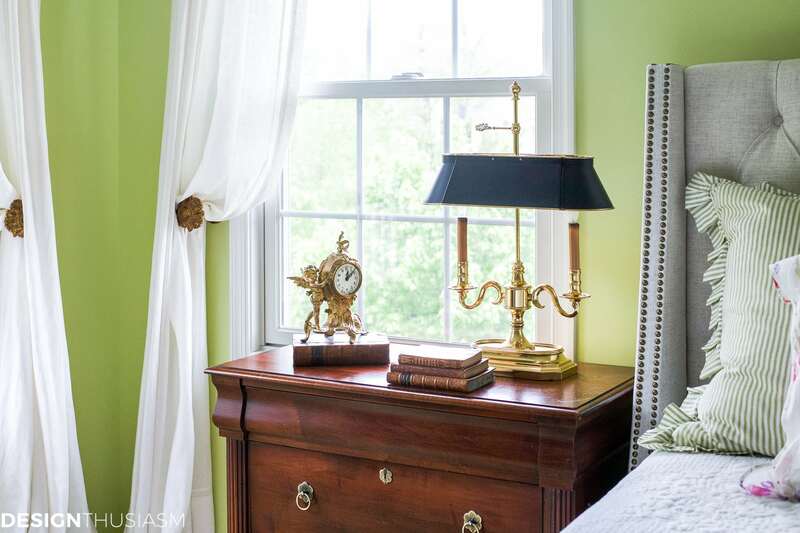 My French Country style bed, tall chest and armoire are a distressed cream color. I needed a bedside table and another small chest for near the door. The tall chest has a dark wood top so I choose darker tones to ground all the cream. the first piece I bought for a bedside table was too wide and too short. I moved it across the room and the dark wood/burgundy painted Bombay chest is perfect next to the bedroom door. I finally found a small one drawer cabinet to use as a nightstand. The curved front is a tie-in to the rest of the furniture. It has a medallion like dark gold design on the drawer and door. The most recent addition is a padded bench at the end of the bed. I knew it was the right pieces the minutes I saw it My headboard has an iron inset and the bench has an iron crosspiece between the cream painted legs and a linen top. A tall bed makes having a bench a major plus! Ah perfect! Sounds like you made just the right refinements, Nancy!! Love this room! 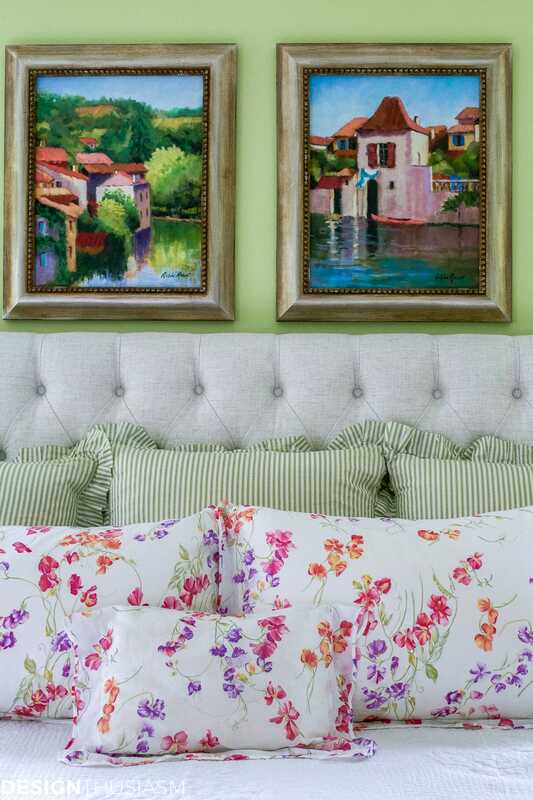 A question when one purchases a white or near white fabric headboard – does it get dirty from leaning against it when sitting in bed? 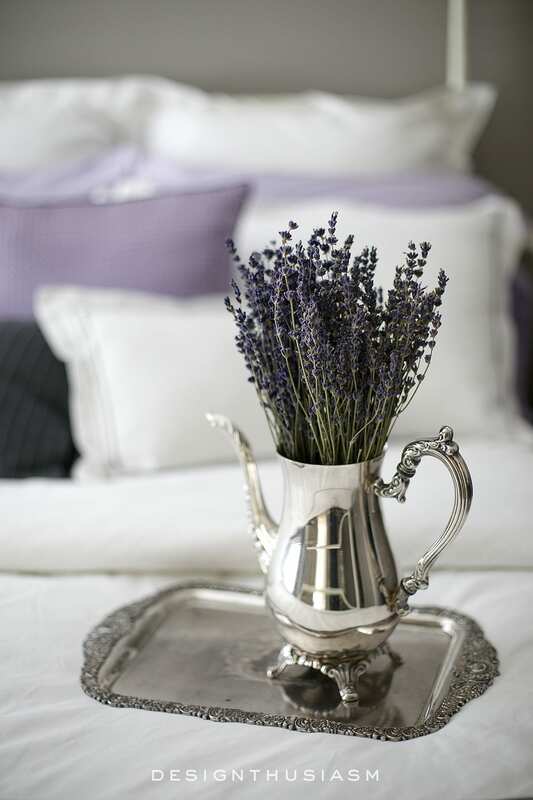 Realize pillows help, but still heads can lean back and that has the potential for dirt/oil. Thanks, Margaret! That was certainly a concern of mine, but we do have big euro shams plus 2 sets of pillows each, so our heads don’t seem to touch the headboard. We’re also not the tallest people around… 😉 I have a basic theory with home furnishings. I’d rather live with what I love for as long as it lasts, than buy something I don’t love and have it last forever. For this reason, I bought a fairly reasonable headboard and of course I hope it lasts a long time, but at least I will enjoy it more than the dark wood bed I had before. I don’t see a link to the pretty green and white pillow shams. Do you have a source for them? Thanks! 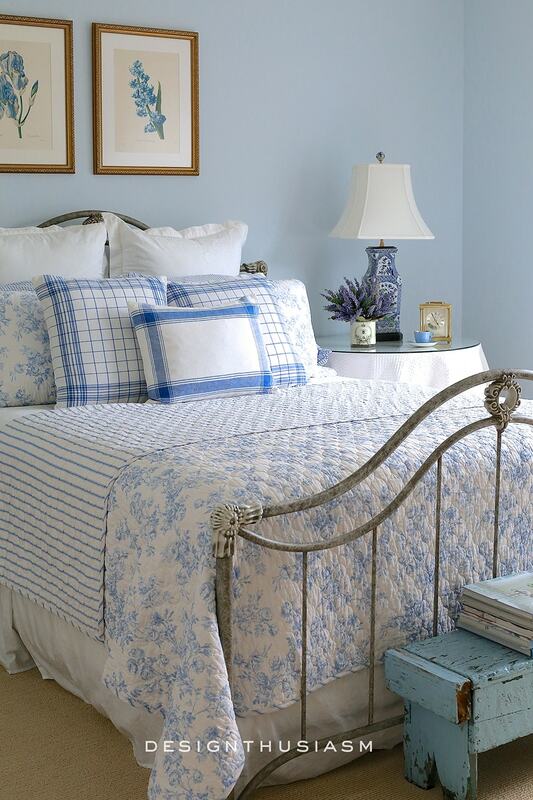 Those sweet pea sheets are tdf. One thing: It’s probably my computer, but the headboard reads as grey to me. Thanks! I do love the sweet pea pattern and it makes me happy to wrap up in it… 🙂 The headboard is definitely not grey, but it does have some tweedy flecks of beige in it. Love your new headboard, Lory! 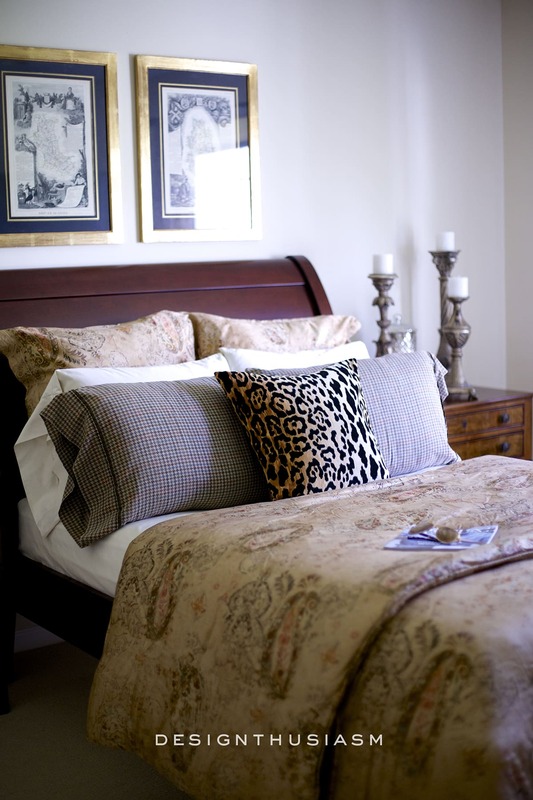 I have been thinking and looking online for vintage and new headboards/bed sets while we are waiting to move into our new-to-us home here in Texas… Hubby doesn’t know it yet, but I WILL be buying one eventually since our daughter has our cherry carved bed set, which was a queen. We moved up to a California king but think we may step down to a king with the new house and sell the former. That secretary is especially pretty.